2pm is a modelling agency with an intellectual feel. Not only does 2pm provide world-class models to their clients, the agency is also a trusted partner within development of image campaigns, product placement, celebrity endorsements, etc. 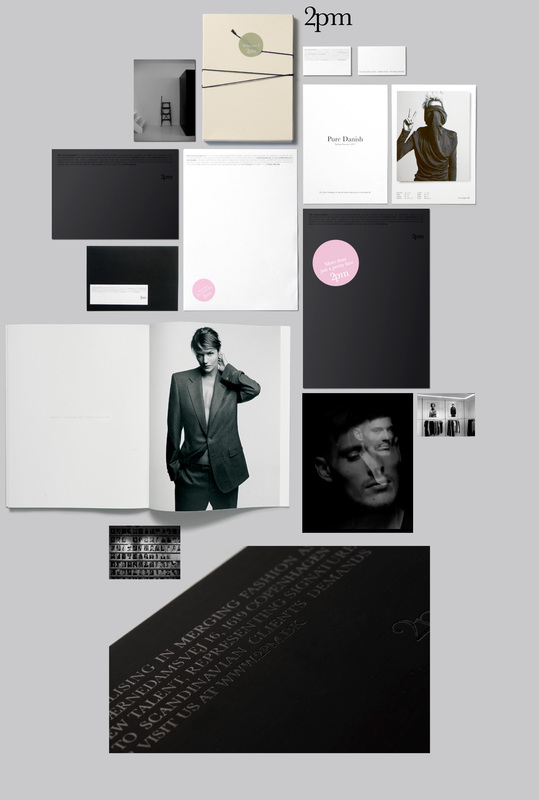 The task was to create a new visual identity for 2PM, as well as an unconventional promotional book, with portraits of the 16 most famous models represented by the agency. We created an understated visual identity for 2PM, which manages to strike a balance between representing the agency and their models, as the identity makes room for the models to be promoted, as well as 2PM. is why the models are portrayed in their own clothes. All text next to the portraits is embossed white-on-white, which makes it appear as "hidden" information (name and other occupation). The pages are doubled, which gives every portrait a "hidden” inner side. The "hidden” inner sides change colour from model to model and on the top of these pages is a statement from the model, supporting the experience of the different characters behind the portraits.